Astigmatism mainly occurs when the cornea (front surface of the eye) is not spherical (round) in shape. Less frequently, astigmatism may be due to irregularities in the shapes of other components of the eye, such as the lens or the retina. Astigmatism causes focussing error because light that enters the eye in one direction is focussed differently to light that enters the eye in another. This results in a blurry image being formed at the retina (light sensitive tissue at the back of the eye). Astigmatism usually leads to difficulty in seeing fine detail, as well as eye strain and headaches if the degree of astigmatism is high. Astigmatism can be corrected with glasses or contact lenses, although higher levels of astigmatism are better corrected with rigid and scleral lenses (see below). There are 2 types of astigmatism: regular and irregular. A good way to think of the surface shape of the cornea is to think of everyday objects: a basketball (no astigmatism), a football (regular astigmatism) and an egg (irregular astigmatism). Astigmatism can also be classified as mixed, hyperopic or myopic. This is mainly academic, so we wont get into it. Regular astigmatism: caused by a cornea which has only 2 curvatures. Most people who don't have keratoconus have this type of astigmatism. Irregular astigmatism: caused by a cornea which has more than 2 curvatures at varying angles. This is most commonly seen in keratoconus, but can also be seen in people who have had unsuccessful laser eye surgery and eye injuries. 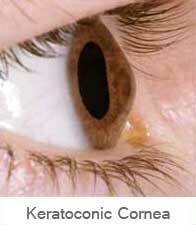 Keratoconus is a progressive, non-inflammatory thinning and protrusion of the cornea. This creates corneal distortion, and always results in irregular astigmatism. So all people who have keratoconus have astigmatism, but not all people who have astigmatism have keratoconus. 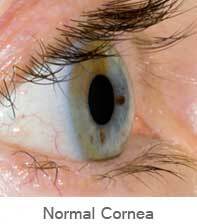 Keratoconus usually starts in youth or adolescence, although the age of onset can be anywhere between 7 and 50. It is usually in both eyes, but almost always worse in one eye than the other. It is estimated that 1 in 2000 people have keratoconus in Australia, although this number is probably higher because not all Optometrists have a corneal topographer to diagnose the milder forms of the condition. Eye rubbing behaviour is frequently associated with keratoconus, so it comes as no surprise that people who have keratoconus also tend to have eye allergies. The distortion produced by keratoconus is not fully correctable with glasses. Rigid contact lenses provide the clearest vision for people with keratoconus. An exciting new solution is emerging which promises much better comfort than standard rigid contact lenses - scleral lenses. Read below for more information. Scleral lenses combine the amazing optics of a rigid contact lens, with the comfort of a soft contact lens, and are resistant to drying out. Soft contact lenses are generally not the best choice for people with large amounts of astigmatism (over 2.50 dioptres). This is because a soft contact lens has to rotate to a precise angle to correct vision. Soft contact lenses often rotate with blinking, causing fluctuating vision. Soft contact lenses are also prone to drying out. Soft contact lenses are not suitable to provide vision correction for people with keratoconus. Rigid contact lenses are much superior optically to soft lenses. They work by effectively creating a new front surface to the eye which is spherical. This works both for people with high amounts of astigmatism and for people with keratoconus. Rigid lenses align with the cornea automatically because of the curvatures used and hence provide much sharper and more stable vision. The only downside is, as they are small, interaction with the eyelids and the edges of the lens gives a foreign body sensation. This gets better over several weeks as the eyelid becomes adapted to the lens. Scleral contact lenses are a huge technological advancement and are now benefiting patients who haven't been able to wear rigid contact lenses. Scleral lenses are a lot bigger than rigid contact lenses and slightly bigger than a soft contact lens, so the eyelids don't tend to rub over the edges. When fitted correctly they can feel as comfortable as soft contact lenses, but with the excellent optical clarity a rigid lens provides. The materials used in a scleral lens don't soak up tears from the surface of the eye. This means that scleral lenses don't dry out like soft contacts do towards the end of the day or when staring at a computer screen all day. So you get the comfort of a soft lens, with the optics of a rigid lens and less dry eye sensation. Scleral lenses are a lot harder to fit and require much higher levels of skill and expertise, so not every Optometrist will give you this option. Scleral lenses are providing a revolution in vision correction for people with keratoconus and high amounts of astigmatism. We are proud to bring this option to people who will benefit from it in the south west.